BoingBoing is a popular blog, that originally started as a zine in 1988, that covers interesting information from around the web. The Pittsburgh Signs project started as a website and was turned into a book was founded by Pittsburghers – Jennifer Baron, Greg Langel, Elizabeth Perry and Mark Stroup and contains photos submitted by many others. I just went way back to the IheartPGH archives and actually I think the Pittsburgh Signs Project was one of our first 15 posts back in September of 2005 you can check out that post here. Here is a set of photos from Flickr tagged Pittsburgh Signs. for $125. I just checked the CMU Bookstore site and they have the book in stock for $29.95). 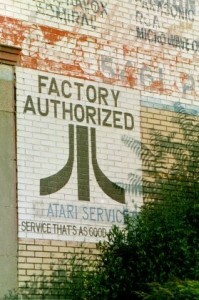 One of our favorite signs was the Atari Sign along Penn Avenue. The Atari repair sign was located near what is now Salt of the Earth. Thankfully the Pittsburgh Signs Project has that documented. Because we think this book is awesome – we are going to giveaway a copy. To enter just leave a comment with a link to your favorite sign from the Pittsburgh Signs website or Flickr or upload a photo of your favorite sign to the comments below. Next Wednesday, August 10, 2011. 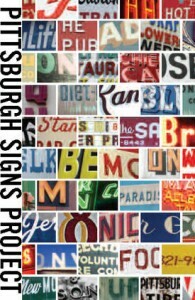 We will randomly select one entry to win a copy of the Pittsburgh Sign Project Book. All comments must be posted by Midnight, Aug. 9, 2011 to enter.